This popular, self-contained storage system features steel construction with four 3 in. ball bearing swivel casters (front 2 lock). Holds up to 12 Hanging Clamps in Pivot Brackets (included) that swing open for easy access to contents. Easy set up. 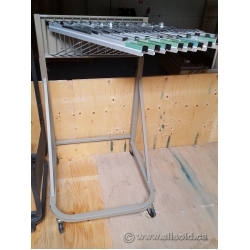 Model #5026 - Mobile Stand Tropic Sand Width is 27 in. overall, base extends 27 1/2 in. to 37 1/2 in. height adjusts from 43 5/8 in. to 61 5/8 in. Includes 12 hanger arms and 10 hangers.